If you don't have a clean? Windows machine available, then for testing, trialling and general applications we recommend installing neatComponents onto a Cloud Machine. This is also the recommended method if you are a Mac or Linux shop without access to a Windows machine. Remember - once installed you continue to develop your applications using simply your favorite web browser on any platform . neatComponents makes it possible to build HIPAA or PCI compliant applications using the Amazon EC2 Cloud. neatComponents can be easily and inexpensively (pricing...) installed onto an Amazon Web Services AWS EC2 Instance following the normal neatComponents installation procedure. Here are step by step instructions for creating your own Windows server and then installing neatComponents. We provide detailed instructions for using AWS. There are alternative Cloud suppliers. The same general principles apply. In each case simply get a W2012R2 or 2016 base edition without any 'database' package. The whole process is managed by a wizard - and you only need specify a few options. 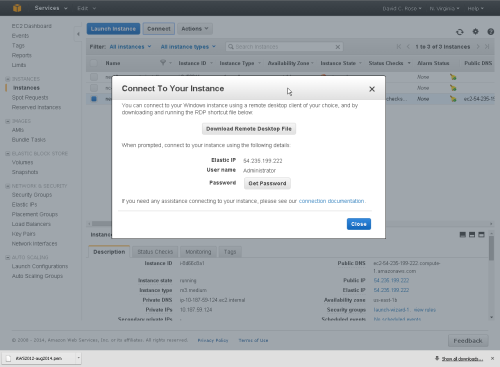 Choose a region where you want the server located, using the dropdown at top left, and then click the 'Launch Instance' button to access the AWS wizard to create the actual server instance. 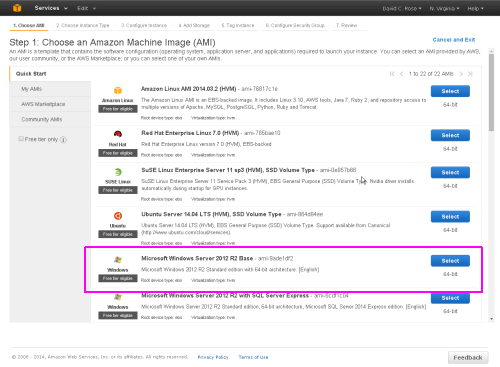 Initially, you should select a Microsoft Windows Server 2012 R2 Base instance. The 'Micro' option is too light-weight and slow for practical use. You can choose any of the other available Instance sizes. We suggest a Medium for general trial purposes. 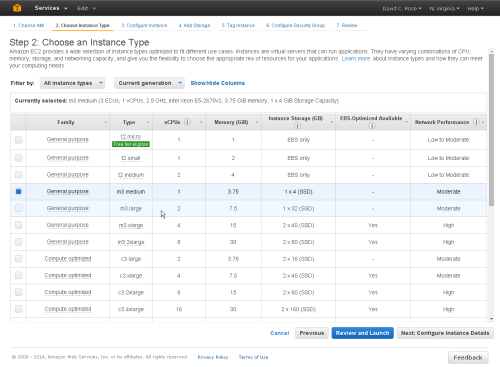 You can later change the Instance Type from the AWS Management Console if you wish to. On the next screen, under Configure Instance Details, select the 'Termination Protection' checkbox and leave the other settings at the suggested defaults. Accept the default values given for Storage. 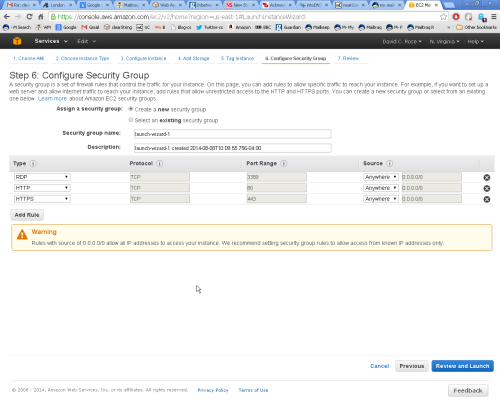 Note that by default EC2 Storage is not encrypted. If you need Encrypted storage you can convert to it later as explained below. At the next screen you can add a 'tag' to the Instance, so you can recognize it easily in the Console. Leave the 'Key' value at the default 'Name' and in the 'Value' box enter 'neatComponents Install' or whatever name you wish to call this Instance. It is very important to configure the EC2 firewall to allow HTTP and HTTPS traffic from anywhere. Create each rule by selecting from the 'Add Rule' drop-down selector, first HTTP - then click 'Add Rule', next select HTTPS from the drop-down and click 'Add Rule'. When you are done the display should look like the above. 3389 (RDP) should be pre-selected. If not add it at this stage, or later when prompted by the 'Connect' option. from the Navigation (left-column) menu of your AWS Console. You will see warnings that say 0.0.0.0/0 allows access from anywhere. 'Anywhere' is correct for public web applications. although you may choose to do so later. At the next screen you can review your choices before completing the wizard. At the next screen, select the 'Create a new Key Pair' option and then follow the prompts. When the wizard completes you will be presented with a view of the AWS console with your instance ready to Connect. Setting an Elastic IP is discussed below. If the Instance is not running - or you are returning to the Console. 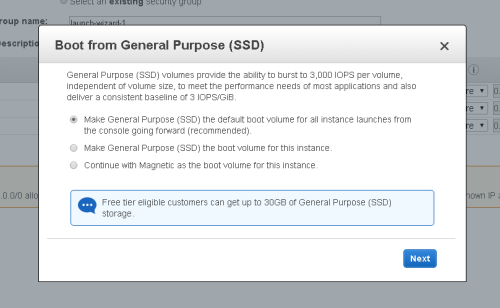 Select the Instance, and then from the menu (highlighted above), select 'Launch Instance'. Your new cloud server will start in a few minutes, and when it does the lower part of the screen will be fully populated as shown above, and the Console will report that the Instance is 'running'. When you are finished using your Instance you may either Stop or Terminate. Stop means 'shut down'. The Instance no longer runs but can be later restarted and will retain your Installations and websites. 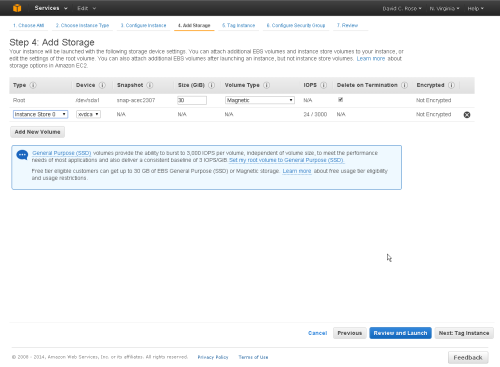 There will be a small charge by Amazon for retaining the non-running Instance. Terminate means stop and remove the Instance. All data, Installations and websites will be lost. You can use the Console 'Actions' - 'Change Termination Protection' to help prevent accidental deletion. If you are creating a production server that is to be say HIPAA or PCI compliant it will need to have storage that is 'encrypted at rest'. 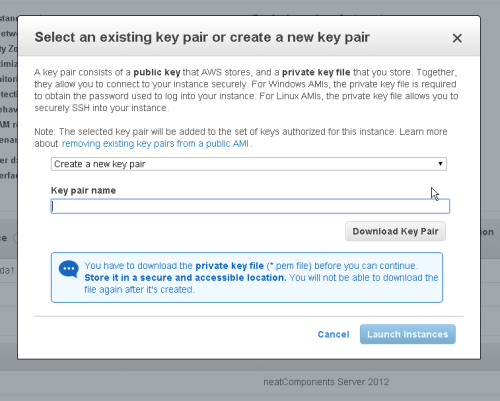 You should use your newly created instance to create an encrypted instance before installing neatComponents. In Instances, Select the Instance. Stop the Instance if it is running. Actions, Image - Create Image. This creates an unencrypted AMI from that Instance. It appears under Images | AMI. Give it a name (e.g. MyInstance-Encrypted) & check the box to [x] Enable encryption. Refresh the AMI page to see the new AMI. The process may take several minutes. 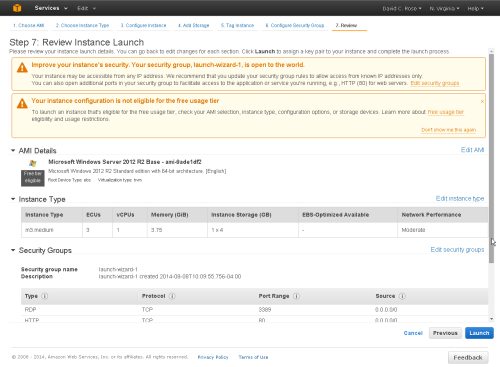 Create a new Instance from the [Launch] button. 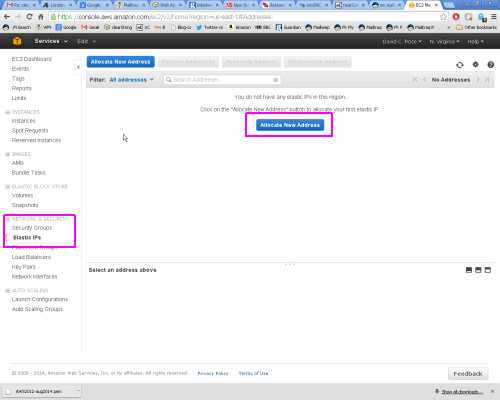 Important: Select the left tab menu 'MyAMIs' to select what type of instance to launch: not the default tab. Select the encrypted AMI you just made, and provision as explained above. You will see as the wizard progresses that the storage for this Instance is now encrypted. You may then remove any unwanted Instances, AMIs or Snapshots. You can connect to the server using the 'Instance Actions' menu, select 'Connect'. 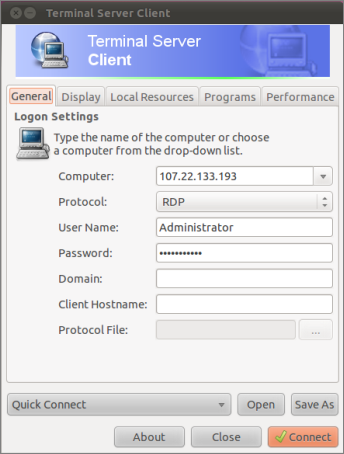 A wizard will hand you through obtaining your password and provide a shortcut to a RDP (Remote Desktop) session. Download the shortcut file, and run it. 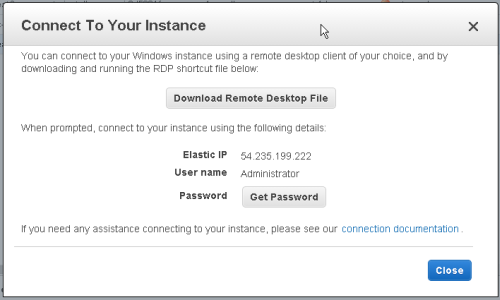 A Remote Desktop session will start on your new Instance. Log into Windows with the password you created earlier. You are now at the Windows desktop. A first time use wizard will ask you if your network use is to be Home - Work - Public. You should choose Work . You should ensure that Port 80 is open. Once you have access to the server you can follow the normal neatComponents installation procedure. Do be aware that with small Amazon instances, as recommended above, the initial installation (particularly when you add Roles to the server) may take an extended period (an hour or so), during which the server will be running at 100%. This is caused by Amazon throttling the system to their system limits and changes from time to time. It is also the IP address you use to do a manual RDP connection explained above. You use the Public IP address to set the A-Record in your public DNS records. But each time you stop and then restart your instance it will get given a different IP address. You will need to use an Elastic IP Address to stop the IP addresses changing each time you stop and restart your EC2 instance. Elastic IP addresses are public static IP addresses that you can map to an instance, and will not change even if you stop and restart the instance. 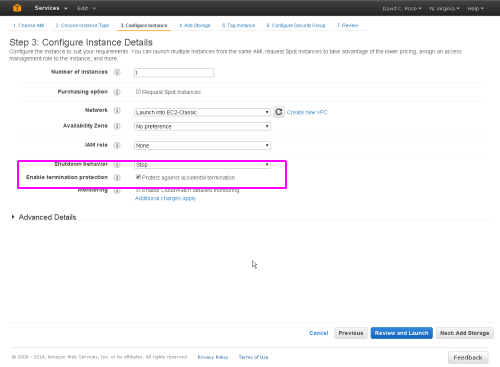 Confirm that you will be using the Elastic IP with an EC2 server. 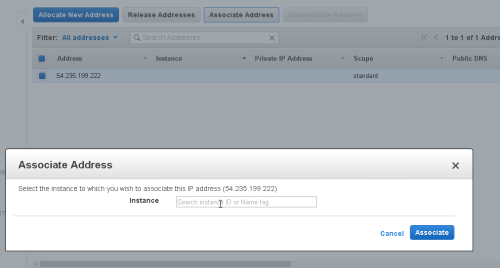 Select EC2, and "Yes, Allocate"
The instance is now set to use the Elastic IP as it's public IP address. If you RDP in to the server you will now need to use the Elastic IP address instead of the one allocated to the instance initially. If you are currently connected via RDP the connection will be broken, and you will need to reconnect using the new IP address (use the same password). When you set DNS A Records to point to sites on your instance, they should be set to the Elastic IP address.